The Cook Bros. VGS stem rather resembles the U.S.S. Discovery on its way to Jupiter. 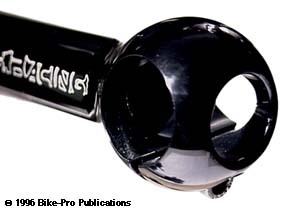 Borrowing the ball end shape from the Cooks Bros. cranks, the VGS uses a ball at each end of the extension. The extension, binder, and quill tube retaining ball are all part of a single piece of billet aluminum that is turned on a lathe to create the "dog bone" shape. The quill retaining ball is 37.63mm in diameter. A hole is drilled from the top down into the ball to make a 13mm diameter recessed cradle for the expander bolt head and make an 8mm pass through hole for the bolt shank. The quill tube has a 22.22mm outer diameter. It fits perfectly perpendicular into the bottom of the quill tube retaining ball. The tube has a 2.18mm wall thickness and is made of non-rusting stainless steel. It is pressed and bonded permanently into the quill ball. The extension diameter ranges from 27.63mm in diameter near the quill ball reducing in diameter to 25.44 before it starts to enlarge and make the binder ball. The binder ball is 44mm in diameter. Drilled through it horizontally is the 25.4mm dimaeter hole for the handlebar. Two holes are drilled from the front, one 20.4mm in diameter centered from the front. The diameter of this hole is reduced to just 19mm as it pierces into the extension, the 19mm hole continues for 125mm (in the 150mm length, 110mm in the 135mm length) into the extension. A second smaller hole is drilled, centered at the bottom af the binder ball with a very slight upward angle. This is for the binder bolt, it recesses the head, and the rearward side is tapped with threads. A 3.5mm upward saw cut creates the cinch mechanism. The binder bolt is made of stainless steel with 6mm x 1mm threads. Its 14mm long, weighs 5.5 grams an is tightened with a 5mm hex wrench. The expander bolt is machined from Titanium 6Al-4V, is 120mm long, with 8mm x 1.25 threads, has a 6mm hex fitting and weighs 24.5 grams. The wedge is extruded aluminum with light machine work to bore a cavity and tap the threads. 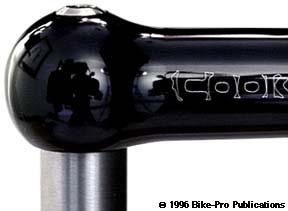 The VGS comes in a glossy Black anodized finish with COOK BROS RACING laser etched in outline on the sides of the extension. It comes in 0 degree or a +10 degree rise in two diameters, 1" or 1 1/8", in two lengths, 135mm or 150mm. The weight of a 150mm long, 1" with 0 degree rise VGS is 287 1/2 grams. If you've given any study to any the writing in this book, you will know how rare outright praise is but this stem is just a pleasure to hold, the work is sterling, and the shape and esthetic design deserve the recognition of MOMA. Neither version of this stem is still made. We sold them for $131.99 during the brief period they were available.